I had a little more free time today, so made another card for Falliday at Splitcoaststampers. Challenge #3 asks for a card using the word kindness. I love this sentiment- it can be used for any 'season'. I got out Distress Oxide inks- there are tiny sprinkle marks on this card that are not too visible. 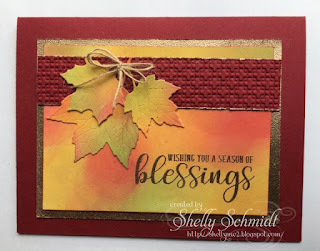 The leaf dies are Cheery Lynn Designs, The cardstock and the EF are by SU. I added a bit of Queens Gold EP (Ranger) to the card to match the sentiment. love the colours and textures on this gorgeous card Shelly! Another beautiful card Shelly. Love that background with the inks and the gold edge. Those dies are gorgeous. I love the creamy background you have created with your oxide inks! So very pretty, Shelly!